Freezing rains and ice accumulation in Wisconsin during the winter often lead to questions about potential ice damage to alfalfa stands. How does ice cause damage to alfalfa? The freezing temperatures of ice often do little damage directly to alfalfa. Temperatures significantly below freezing (less than 15°F when plants have hardened off well) are required to cause damage in alfalfa crowns, one to four inches into the soil. Ice primarily damages alfalfa because alfalfa roots require oxygen during the winter. This oxygen diffuses into the soil from air above ground. A solid layer of ice restricts air diffusion and suffocates the alfalfa. Lack of oxygen is a common reason for loss of alfalfa in low spots in fields. Alfalfa covered by ice for three to four weeks will likely suffer injury or death. How can I assess potential ice damage to my alfalfa? If plants have hardened properly in the fall, cold injury due to ice is unlikely. When determining whether ice sheets will cause suffocation damage to alfalfa stands, one must consider whether the ice is in a solid sheet. If the ice is non-uniform, cracked, or has holes, it will not completely restrict air movement into the soil and consequently less damage will result. In addition, alfalfa stems sticking up through the ice will help create holes that will aid in the diffusion of oxygen. What can I do about ice on my alfalfa? The short answer is nothing. Some growers have used a large tractor and disc to break the ice. This technique generally will not break the ice unless there is a layer of snow in between the ice and ground. Other growers have applied fertilizer to ice with the idea that salts in the fertilizer will melt through the ice and create holes, allowing for air movement. Often, however, fertilizer particles will not melt totally through the ice and thus, fertilizer applications are not effective. In addition, subsequent rainfalls or even melting of the ice can lead to substantial runoff problems, particularly if the fertilizer contains nitrogen or phosphorus. Because of runoff issues, current nutrient management standards prohibit most nitrogen and phosphorus fertilizer applications on frozen or snow-covered soils, except when an application is made to winter grains. Even broadcast applications of potassium fertilizers on an ice cover are problematic. If runoff occurs, distribution of the fertilizer can be quite variable and off-site losses could represent an economic loss to growers. While growers may be concerned about ice on alfalfa, their best course of action is to wait and see how long the ice lasts and afterward assess what damage, if any, that has occurred. In the recent past, ice sheeting has occurred across central Wisconsin for at least eight weeks with very little resulting winterkill or injury. 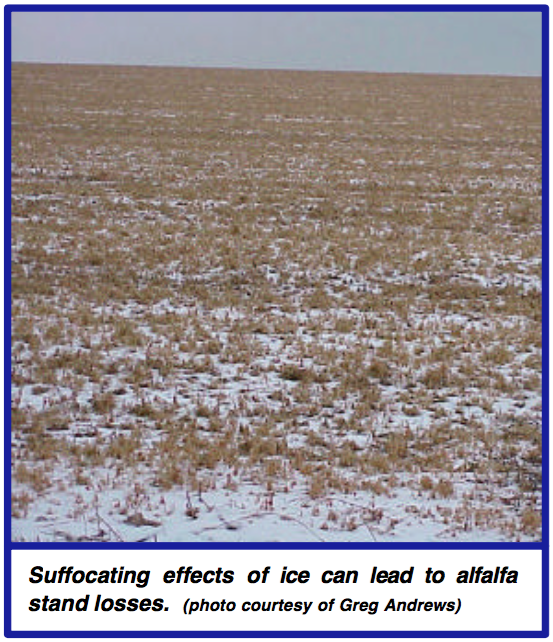 For more information on ice damage to alfalfa: Contact your county Extension agent. © 2005 by the Board of Regents of the University of Wisconsin System doing business as the division of Cooperative Extension of the University of Wisconsin Extension. An EEO/Affirmative Action employer, University of Wisconsin Extension provides equal opportunities in employment and programming, including Title IX and ADA requirements. The document can be provided in an alternative format by calling Brian Hudelson at (608) 262-2863 (771 for Wisconsin Relay). References to pesticide products in this publication are for your convenience and are not an endorsement or criticism of one product over similar products. You are responsible for using pesticides according to the manufacturer’s current label directions. Follow directions exactly to protect the environment and people from pesticide exposure. Failure to do so violated the law. Thanks to Bryan Jensen, Kevan Klingberger, and Mike Rankin for reviewing this document.